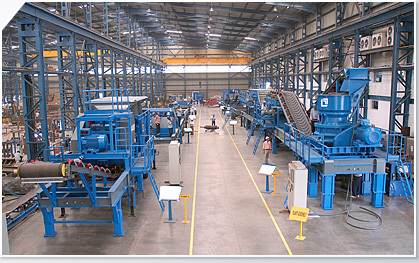 With twenty years experience in manufacturing critical equipment for the cement industry at Gurgaon, BHP Infrastructure (P) Ltd has built a modern manufacturing facility, at Faridabad, on National Highway 2 in the Delhi National Capital Region. The BHP Infrastructure plant has been designed for heavy fabrication and assembly and is well-suited for contract manufacture of equipment and components for construction, mining and other industries. BHP offers manufacturing and engineering services of a high standard to international companies that would like to benefit from the lower costs that can be derived from India in tune with the company motto - "Value without Compromise". Faridabad is a well established industrial area with sources for castings, forgings, raw material, electrical equipment and industrial products. BHP Infrastructure can offer quality certified components like machined castings, metal pressings, pumps, housings and wear parts, benefiting from the quality control planning and engineering processes of the company. BHP Manufacturing facility has 8,000 sq. mtrs. under six overhead cranes up to 25T arranged in three dedicated bays of machining, fabrication and assembly. The Assembly Bay is 22m (72') wide with 9m (29'6") height below hook and serviced with pneumatic lines to support quick fit assembly. The Fabrication Bay is 18m (60') wide and has Submerged Arc and MIG Welding stations, Grit Blasting and Painting facilities. The Machining Bay is 16 mtrs(50') wide with a computer controlled plasma cutting table, a 750T Cincinnati CNC Press Brake, a 160 mm spindle dia Horizontal Boring Machine, a heavy Plano Miller and a 300T Hydraulic Press. The plant has 3,600 sq. mtrs of stores, 4,500 sq. mtrs. of office space and a well equipped metallurgical test lab. BHP Graduate engineers are experienced in product engineering, tool design and systems engineering and possess expertise in AutoCAD, Mechanical Desktop and Solid Edge. They have used their domain knowledge in the cement, material handling, construction equipment, crushing and screening industries to provide engineering solutions for US, Swedish, Italian and Australian companies.